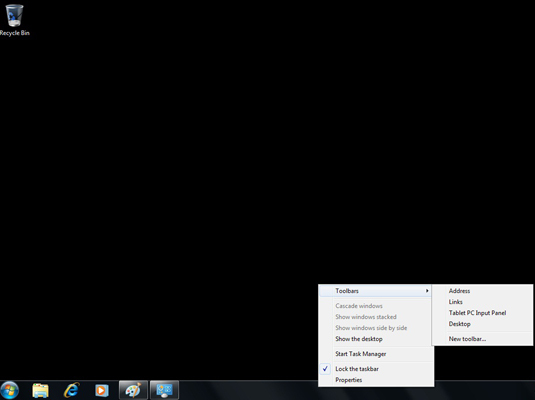 One of the ways you can make Windows 7 work for you is by adding toolbars to the taskbar along the bottom of the desktop. The new and improved taskbar is one of the biggest changes in Windows 7; it’s your entry to the most commonly used programs in Windows. Address toolbar: You can use this to directly enter pathnames for files and folders you want to open or URL addresses for Web pages. Links toolbar: Create a toolbar of links to your favorite Web pages by dragging the favicon (the image to the left of the Web address) to a place on the toolbar. Tablet PC Input Panel toolbar: Create a toolbar (a button, actually) that opens the Input Panel on the Windows 7 desktop, where you can write your entries. You need to be running Windows 7 on a Tablet PC laptop computer for this option to work. Desktop toolbar: Gives you access to all the desktop items on your computer. To add any (or all) of these toolbars to your taskbar, right-click an empty location on the taskbar and then choose Toolbars from the pop-up menu that appears, followed by the name of the toolbar to add.